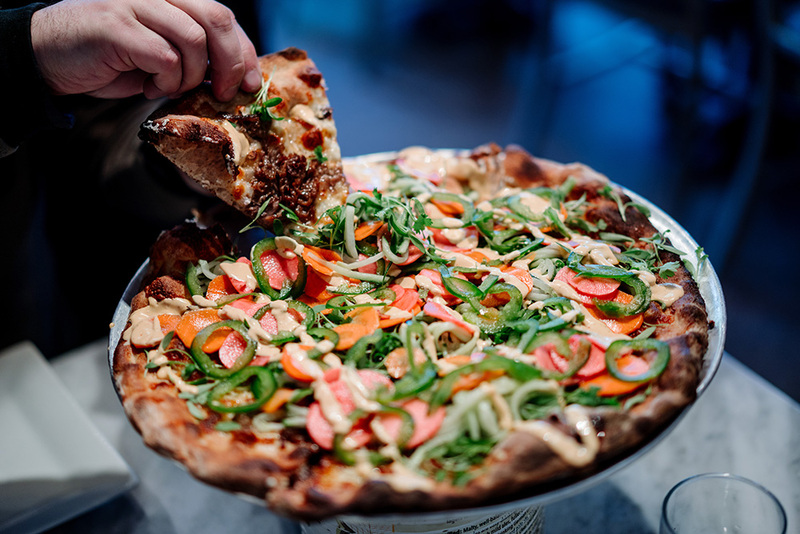 Bite of the Week: Banh Mi Pizza at Red Wagon Pizza Co.
It’s a pretty familiar trick: You name a thing—a burger, a pizza, a sandwich—after a totally unrelated thing as an excuse to steal some of its flavors. When you order a pizza burger, you’re not really going to get a pizza—you’re going to get some broad Italian-American flavors (in the shape of sweet marinara and a ton of melted mozzarella) dumped onto the burger format. 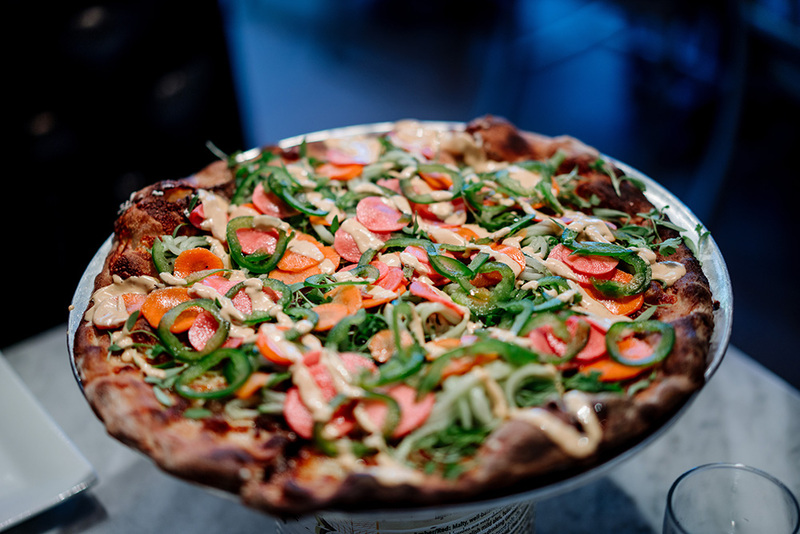 So when we saw the Banh Mi Pizza at Red Wagon Pizza Co., we were intrigued but skeptical. Dumping some pickled veggies and pork onto a pizza doesn’t make it a banh mi. And yet: wow. The pizza hit the table and the smell of pickled veg and roast pork floated seductively up toward us, and the pie itself could hardly be seen for all the greenery, sliced carrots, and sliced radishes that it swam beneath. With the first bite, it was clear that this wasn’t a banh mi–themed pizza—this was the flavor-driven essence of the beloved lunch standby in a round, flat format. The earthiness of the cilantro, the sweet and savory depth of the soy-glazed pork, the mild kick of the jalapenos and Sriracha aioli, the vinegar tang of the quick pickled veg: it was all present, and in ratios that would work well on a traditional sandwich. As for the baguette, the crispy chewy crust of Red Wagon Pizza was a surprisingly close stand-in. It’s a new form factor with all the lovability of the original incarnation. The Reason: It’s a remarkable transformation of one thing into another, and it’s delicious as hell.